Carry bags are included with purchase to make bringing the display to different events simple! Aluminium stand features silver finish that works with any décor & is durable for use everywhere! Also available without graphic - click here! 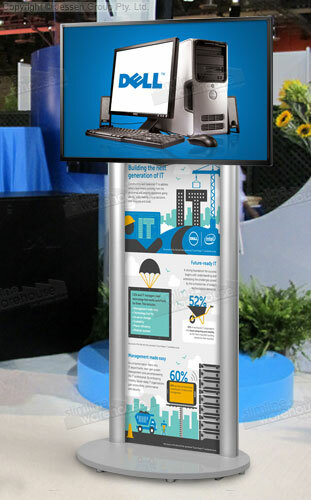 This screen stand combines traditional advertising with the latest in technology to offer both dynamic advertising options alongside static imagery to best convey your message! Your custom designs are printed on 3mm thick PVC for a durable representation in vivid full colour that is able to withstand standard use in most locations for years to come! The LCD television display, screen stand is designed to hold televisions that are 32" - 65" plasma, LED, & LCD televisions that weight up to 45kg! 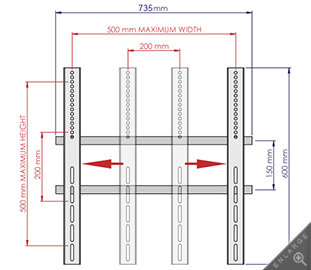 An adjustable height bracket allows you to position the flat panel at your desired height and is VESA compatible for 200 x 200mm through 500 x 500mm to fit most makes and models of televisions without issue. A plasma TV stand is useful in a number of different locations, including retail stores, exhibition halls, transit stations, shopping centres, trade shows, and car dealerships. Carrying bags are included as well that make bringing this stand to and from different events easy, and help keep the display tidy if stored in between uses! Order this style of stand today for placement at your business to really reach out to customers in an exciting manner! The various types of plasma TV stand displays we offer are all accessible by clicking here. We include many types of monitor & television holders, including wall-mounted brackets, desk mounting arms, and of course floor stand displays! With hundreds of different products to choose from in a wide variety of categories, our online catalogue is your best bet online to find exactly what you need to outfit your business in style without breaking the bank. Our selection of products currently includes exhibition displays, corkboards, iPad stands, A frame signs, light boxes, standoffs, cafe banners, stanchions, hanging hardware, event flags, and many more options! Slimline Warehouse is a national leader with many different products to choose from in heaps of categories, building a reputation of offering only quality products at low prices in our over 20 years in the business. Same day despatch is provided with most in stock products that have been purchased by 1pm EST to anywhere in Australia. Order now for your business in Perth, Sunshine Coast, Melbourne, Sydney, Canberra, Brisbane, Sunshine Coast, Adelaide, Hobart, Wollongong, & Alice Springs! 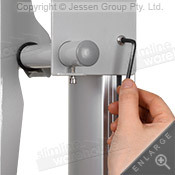 Universal bracket holds a 32" - 65" television that weighs up to 45kgs. 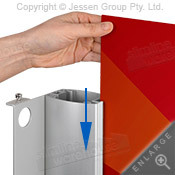 The expandable bracket fits VESA sizes 200 x 200mm through 500 x 500mm to accommodate most makes and models. Additonally, our TV mounting guide shows how your TV may look when mounted onto the bracket. 32", 37", 39", 40", 42"
46", 47", 49", 50", 55", 60", 65"
Slide bracket up or down to adjust TV height. Poster slides easily into post channels. Click here to see our online catalogue, with hundreds of items broken down conveniently into different categories that help your business to really stand out, all with products that are offered at low prices that can't be found anywhere else online! Our selection currently includes many POS signs, lightboxes, cafe banners, poster displays, whiteboards, hanging hardware,real estate signs, liquid markers, sidewalk signs, cigarette bins, & many more! Slimline Warehouse is a national leader in POP, POS, retail, & exhibition displays, and has been for over 20 years. Our selection of items has been sourced from local & international vendors to offer the best products possible at low prices without compromising on quality. Order by 1pm EST to receive same day despatch with most in stock products to anywhere in Australia, including Sydney, Melbourne, Perth, Adelaide, Brisbane, Gold Coast, Cairns, & Alice Springs!